Hard on the heels of Topic: Sensible Shoes comes this article from the Daily Mail, about an architect who's gone back to the drawing board with conceptual shoe design. 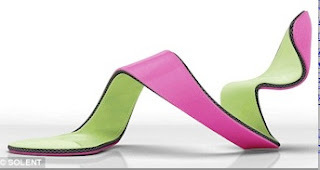 Like many women I must be addled on the subject of footgear because I find these sandals by Julian Hakes gorgeous. Wonder if he has any prototypes kicking around the studio . . . Please note the copyright for the images is Hakes Associates Ltd and not Solent. Will do Hakes Associates! et voila . . .